Last week I made mashed cauliflower for the first time. And then avocado pudding. To be honest, neither went over particularly well. Sometimes new things are a hit, sometimes they’re a miss. And sometimes you need an old thing. A really old thing from your own childhood that you know your kids will gobble up and make them forget all about the misses. 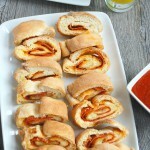 When I was growing up, this Pizza Bread was a go-to recipe for my mom. And it’s a crowd-pleaser around here too. 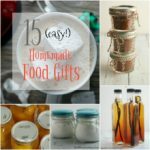 It starts with a pound of bread dough or pizza dough, store-bought or homemade. You can use whole wheat dough (though I usually don’t for the sake of nostalgia). 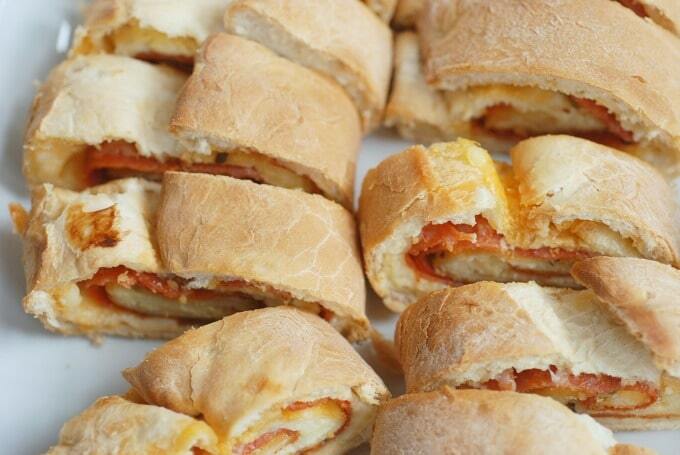 It’s filled with egg, cheese, and pepperoni–but you can customize your own fillings. 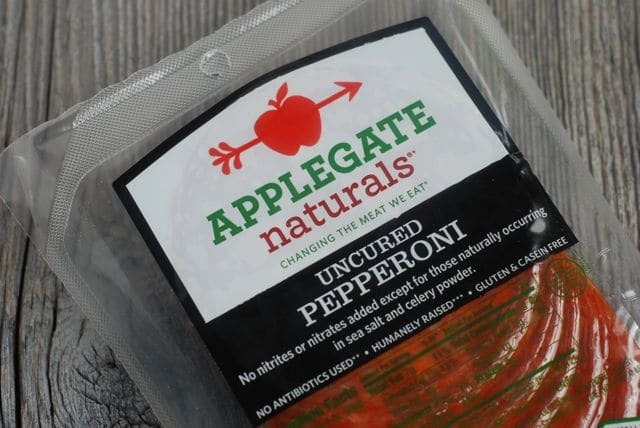 I use Applegate Uncured Pepperoni, made from sustainably raised pork. It comes in nice big slices, perfect for these loaves. 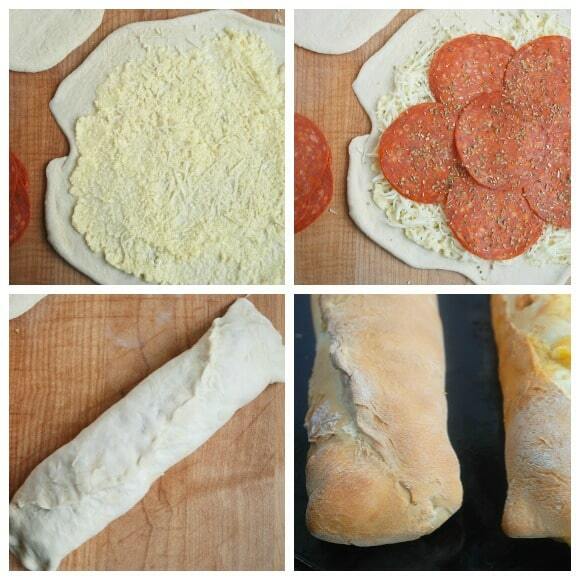 Divide your dough in half and roll each into a 10-inch round. Mix one beaten egg with 1/2 cup grated or shredded parmesan to form a paste and spread half of the mixture on each round of dough. Top with mozzarella and pepperoni, plus a generous shake of oregano. Roll each circle into a loaf and seal edges tightly so all the yummy insides won’t come bubbling out while baking. Seal the ends as well and tuck them under the loaves. Bake loaves on a lightly greased baking sheet at 375 degrees until golden brown, about 30 minutes. My troops don’t care for veggies on the inside, so I serve it with a green salad–plus a few small dishes of pizza or pasta sauce for dunking (get my recipe for Easy Homemade Pizza Sauce). 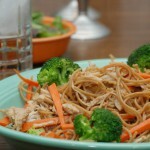 Pack any leftovers (if there are any!) 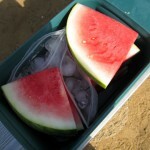 in lunch boxes. 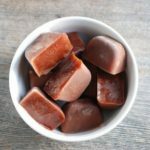 This also makes a great freezer meal. Bake as instructed, let cool, and wrap tightly in plastic wrap and then foil. On a busy night, just defrost, slice, and bake the slices on a baking sheet at 350 until hot and melty. Cut dough in half and roll out each half on a floured surface into a 10-inch circle. In a small bowl, combine beaten egg and Parmesan cheese. Spread half of egg mixture on each dough circle, leaving a half-inch border around the edge. Spread each circle with 1 cup mozzarella cheese, cover with pepperoni, and sprinkle with oregano. Starting at one end, roll up into a loaf. Seal edges. Seal ends and tuck under loaf. Place loaves on greased baking sheet and bake for 30 minutes or until golden brown. 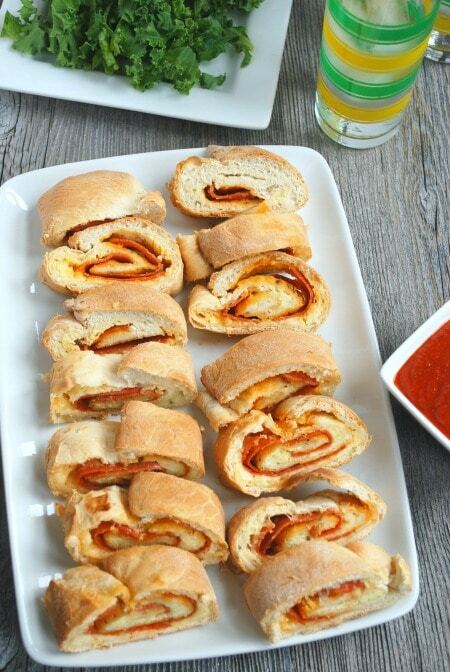 Slice and serve with pizza or pasta sauce for dipping. Disclosure: I’m happy to be part of Applegate’s Sandwich Board and am compensated for my time. All opinions expressed are my own. Is there a way i can make this gluten free and dairy free? You could certainly try, with gluten-free bread dough and dairy-free cheese. Have you made with the sauce in the bread? I see other recipes for pinwheels but no sauce. Does it make the bread soggy? Hi Heather–I have not tried it with the sauce in the bread. If you do, let me know how it turns out! So where’s the nutrition count for the pizza bread? If I’m going to make it, I’d like to know what the calories, etc., are going to run.